Johnson was incredibly bright and gifted, and was promoted to a critical role where she helped NASA with its US space program – including sending astronaut John Glenn into space. The challenge was to get Glenn, whose life was at risk, and his spacecraft safely back to Earth. Without Johnson’s mathematical expertise, Glenn may never have made it back in time. And if that happened, the future of NASA and its space program would have been jeopardised. Despite Johnson’s indomitable intelligence, what was really hindering NASA’s operation was the inherent racism and sexism endemic to US society during the mid twentieth century. This was a time when race segregation still existed, something highlighted in the movie by the fact that the African American women’s bathroom was in another building – Johnson had to walk about a kilometre to use it because she was not allowed to use the white women’s bathroom. NASA’s culture of unconscious bias was not only holding up the nation’s progress as it tried to beat the Russians into space – it was putting lives at risk. It wasn’t until Johnson’s boss Al Harrison (played by Kevin Costner) said, “Where is she? She’s always missing,” that things started to shift. When he realised the reason why Johnson was so often absent – the long walk she had to endure simply to use the bathroom – he ripped down the “whites’ women’s bathroom only” sign. “Katherine will be using this bathroom,” he declared. That moment in the movie was a moment of truth. In his book, The Hero’s Journey, Joseph Campbell talks about how the most captivating movies and stories involve a hero’s journey. There is a moment in the hero’s journey, usually half-way through the story, that’s known as “a moment of truth”. It’s a moment where something changes. It’s a turning point, a catalyst for everything else to come. This was certainly the case in Hidden Figures. Harrison ripping off the sign from the white women’s bathroom was the moment of truth that led to the success of NASA’s space program. Who would have thought that a toilet sign was the thing that was holding up the development and ultimate success of the US space program? The moment of truth happens halfway through a movie, not at the end. It’s the catalyst that makes everything work. The same thing happens in business. NET PROMOTER SCORE- DOES IT REALLY MATTER? So, the real issue with translating NPS into lead generation is understanding our moments of truth. The moments when our customers feel our impact the most and are emotionally driven. “Wow factor” moments, when a client has a breakthrough, when they receive an insight or successful outcome they weren’t expecting as a result of working with you – that’s their moment of truth. That’s when they’re on a high, their reciprocity bank is unbalanced and they are most likely to refer. You need to be attuned to and act upon these moments of truth as they happen throughout your “story” with your customer – not at the end when you’re busy reporting. If you wait until the end to ask for referrals, it’s too late. WHAT TO DO FROM HERE…. So the questions for you are: What are the moments of truth in your practice? What mechanisms do you have in place so you can capture referrals, testimonials and LinkedIn recommendations? 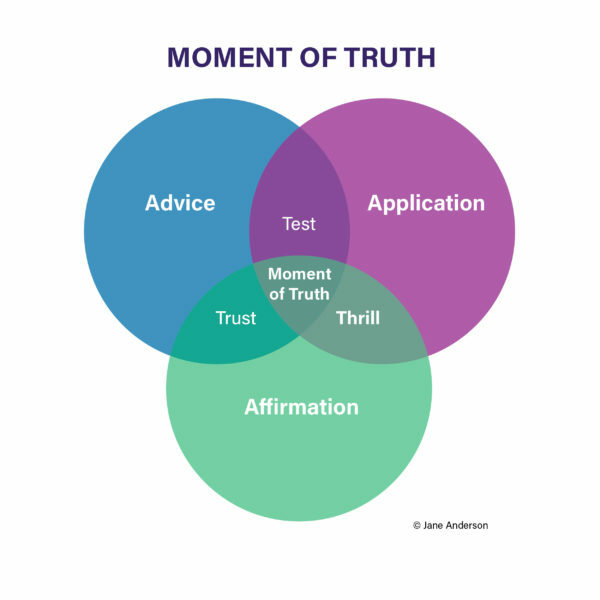 It’s essential you harness the power of your moments of truth so you can increase the amount of trust in your business, capture more leads and have a greater impact on the potential clients who need your help. Love to know your thoughts, oh and yes…. go see the movie!